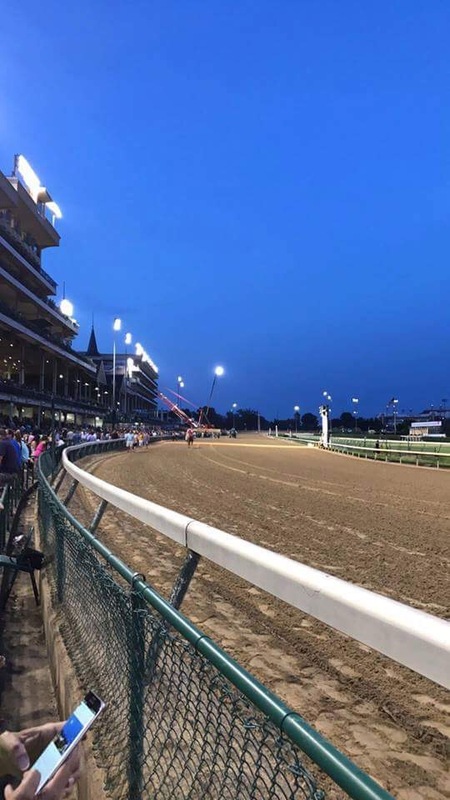 Churchill Downs plays host to many great events: the Kentucky Derby, the Breeders’ Cup, and prep races for their first weekend in May that draw thousands beneath the twin spires. In a matter of hours, millions of dollars in purses will exchange hands or will be wagered online through apps and live-streaming services. The elite of the sport will saunter into the winner’s circle and take pictures with their million dollar horses as they get a garland of flowers placed around their neck or the owners are handed a fancy new trophy for their collection. The blue collar connections will have the race of a lifetime, beat a few of those million dollar horses to boot, and have an experience they’ll always remember. The splendor aside, for a glorious few years, Churchill Downs was also home to Sidna Baker Madden’s horse; a Candy Ride (Arg) gelding by the name of Candip. He raced for different connections at the time, but this was home for him. The definition of a warhorse, Candip earned $415, 659 in his racing career, and he only got better as he got older. By the time his final racing season had rolled around, he had ran an Equibase figure of 116; putting him on par with stakes company. 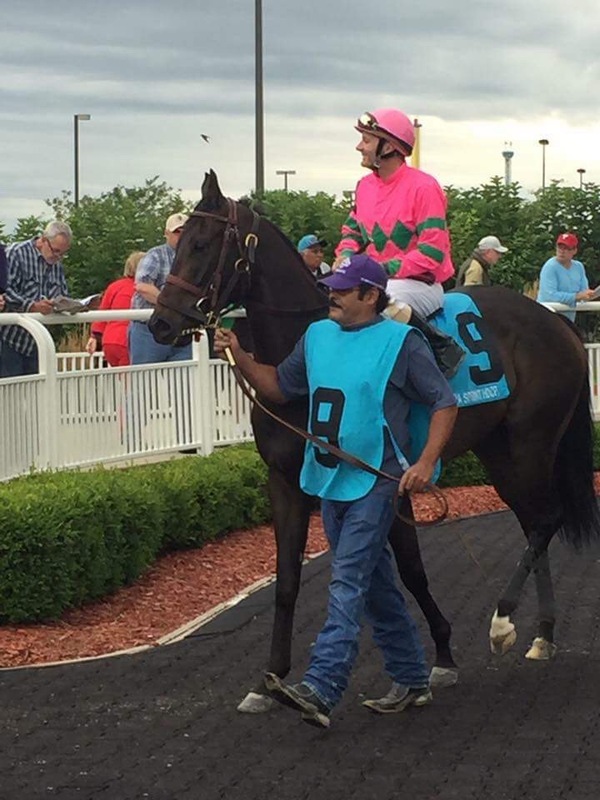 It wasn’t his numbers alone that drew Madden to Candip; the more she saw him at Remington Park when he shipped in, and heard about him from the people that knew him best, the more she fell in love. Here’s the story of how Candip won Sidna Baker Madden’s heart, and how in turn, she would return the favor by not allowing the fear of the unknown to drive her decision making process. 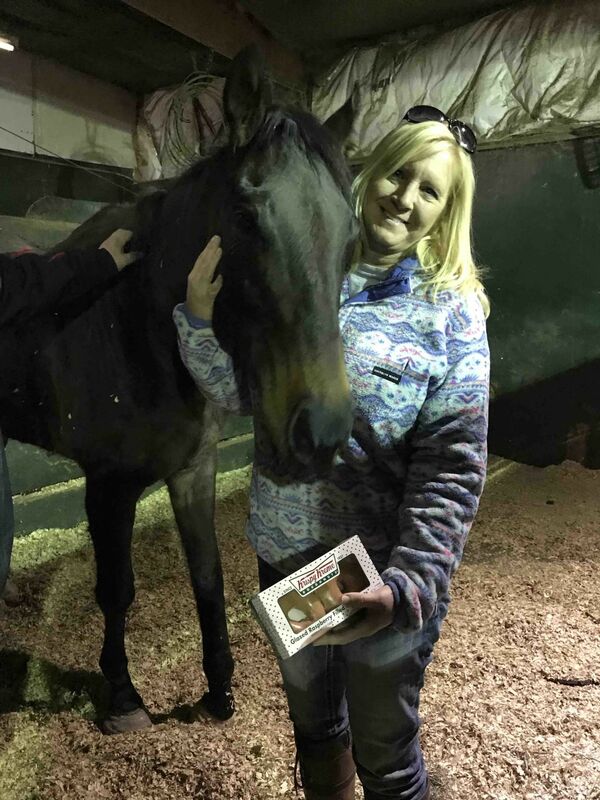 Madden, and her friend Kim Langston, would visit the backside at Remington Park every year on Oklahoma Derby day to see the the stakes horses that shipped in for the race and undercard contests. 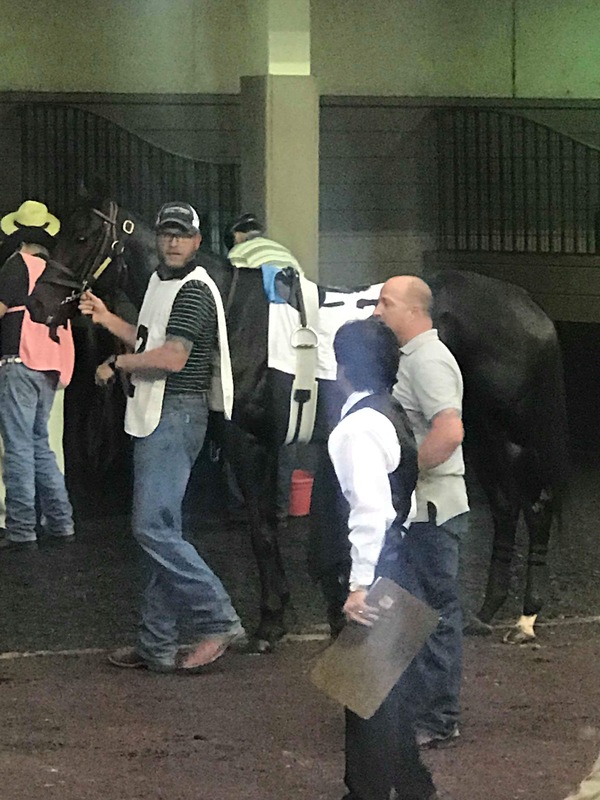 Armed with her owner’s license, they traveled amongst the hustle and bustle as the connections prepared for one of the biggest racing days that the state offered. Then, in September of 2015, they met Candip for the first time. Langston had already seen the horse, race before: twice in 2014 at the Fair Grounds when he won both outings. She recalls how proudly he carried himself and she became a diehard fan of the dark gelding. He was tough, and an exciting runner to watch; a horse like that was one worth following. So, when the opportunity arose to get up close and personal while visiting her good friend, she took it. Even at three, Candip displayed many of the qualities that Madden believes served him best through his career: his Storm Cat attitude (courtesy of his dam’s family), his smart, plotting mind, and being built like a tank. By all counts, he had the looks, the smarts, and the temperament of a very good horse. His grooms Charles Hauswald and D.W. Fries were his biggest fans and their faith in him never waivered. As the “big horse” of the barn, he always got a little extra something here and there. Even now, they check in on him almost every day, and they wanted to remain connected to him even before Candip began having hoof troubles (more on that later). Edgar Cano, who was his exercise rider when Candip was under Mike Tomlinson’s care, raved about how the horse always had several gears but he wanted to run “90 miles an hour with his hair on fire”. That extra kick could make anyone an adrenaline junky and having that kind of power dragging him around the track gave Cano the thrill of a lifetime. He kept many racing photos of the horse he considers “his boy” and has told Madden many times how much he misses “the beast”. All of these connections played in Candip’s favor on the fateful day when he broke down. He had been entered in the 2017 David Vance Sprint, and Madden had been standing in the winner’s circle with David (the race’s namesake) and Langston, who was in town for the race. Everyone felt that it was going to be Candip’s race to lose, and they were prepared for what they thought would be the celebration of the day for the victorious gelding. However, the racing gods proved cruel, and Madden remembers what happened like it was yesterday. We watched with David and as he [Candip] turned for home, he was in some traffic and hit the brakes quickly to avoid clipping the horse in front of him, and when he did, he took a bad step. His jock eased him…stopped him past the wire and held him up until help came. Madden remembers the mortified look on Charles’ face as he ran out onto the track to see what had happened to his horse. She and Langston stood frozen to their spot and watched as the van arrived to pick up the horse they were sure they would meet in the winner’s circle. Now, that celebration would belong to someone else and they would be left in tears, wondering Candip’s fate. Candip had a racing injury that resulted in a slab fracture in his right carpal joint. 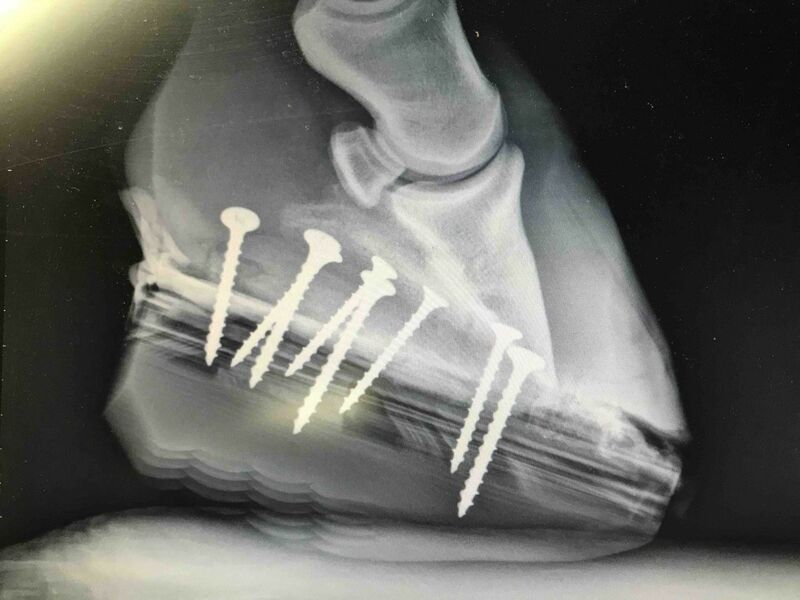 Mike Majors, DVM at Oakridge Equine Hospital, Guthrie, Oklahoma repaired the fracture including screw placement. …the horses give us so much and I must give back to them. Downcast about his injury, but happy that her favorite gelding was alive, Madden resolved herself to follow his recovery as best she could. Not everyone got to see their favorite racehorse once they retired or got injured, so many fans could only hope that the connections were nice enough to provide the periodical update. Ironically, Madden got a phone call from one of her friends about Candip; it was about his rehoming. She had jokingly mentioned the day prior (after learning that he survived) that she would gladly provide a retirement home for him since he was a gelding and it looked like K-Town Partners wanted to take her up on the offer. In her own words, before she knew it, Candip would be going home with her after his stall rest. All seemed to be going well until the gelding came up lame after finishing his 90 days of stall rest, post-knee surgery. After taking some x-rays and being given professional opinions that did not bode well for her horse, Madden was in crisis mode. Refusing to make a rash decision, she turned to her veterinarian friends and was referred to Dr. Micheal Steward. She admitted that she initially had no idea why he was the referral but after reading up about the accomplished veterinarian, she couldn’t get Candip into his care fast enough. Dr. Steward has been the owner of Shawnee Animal Hospital since 1979 and had been the on-call veterinarian for various rodeos and sales for almost 30 years. He graduated from Oklahoma State University with a Doctorate of Veterinary Medicine and is a member of the American Veterinarian Medical Association, the American Association of Equine Practitioners, the Oklahoma Veterinary Medical Association, and the Oklahoma Cattlemen’s Association. His invention, the Steward Clog, has been the source – or part of – at least thirteen conventions spanning back to 2002 and Dr. Steward has traveled internationally as well; speaking about the benefit, application, and use of the wooden shoe to treat laminitis. He is an educational contributor to the American Farrier Journal, the European Farriers Journal, and has served on the advisory board for the American Farriers Journal and for the Therapeutic Riding Center at St. Gregory’s University. He was inducted into the International Equine Veterinary Hall of Fame in 2009. Madden now understood why he came so highly regarded and recommended out of the blue for such a critical case as her horse. He met her last Sunday, and immediately put supportive shoes under both feet to make Candip more comfortable. The source of the lameness proved to be what every horse person fears: laminitis. His left front foot had developed the dreaded disease and its official title was “Support Limb Laminitis”; the same disease whose complications brought down the mighty Barbaro. A previous veterinarian had believed Candip’s lameness to be a result of what they thought was an abscess on his left foot, but radiographs showed a much grimmer picture: his coffin bone had severely rotated and his third phalanx was prolapsing. The most recommended course of action by previous opinions for her horse had been very grim or euthanasia; Dr. Steward had other ideas. Instead of putting Candip down, Dr. Steward applied the “Steward Clog”; a brainchild born and developed out of desperation over a lack of economics and time. …a horse was prolapsing through the sole both coffin bones. I did not know how to nail a shoe on, nor did I have a shoe and pad that I could apply that would help. I cut a piece of plywood in the shape of a horseshoe and screwed it onto the hoof. Three months later, the owner was here for a Coggins test so she could barrel race. I asked about the foundered mare and she informed me that this was the mare. I asked about the wooden shoes and she said they were still on her. I picked up the feet and noticed the boat hull-like form the shoes had developed and the sound horse. Since the introduction of the “Steward Clog” (wooden shoes) more than thirty years ago, we have learned to concentrate on the mechanics of the foot to enhance the ability to heal. 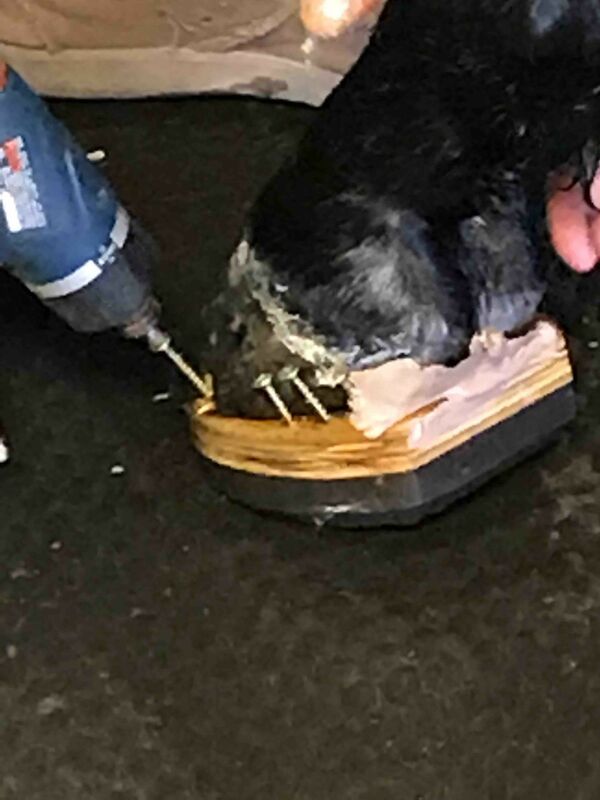 The lamellar apparatus suspends the coffin bone within the hoof capsule and the injury to the lamellar results in the laminae’s ability to do it’s job in holding the third phalanx in a normal manner within the hoof. The injured lamellae can be overloaded just by the horse standing up, or walking which results in the coffin bone migrating if the injury is substantial. The use of a roller motion wooden shoe provides a solid base shoe that can be easily modified to redistribute weight and reduce leverage forces to the lamellar apparatus. This system applies all the mechanics- we now understand -to economically remove the weight forces and shear forces from the lamellae and transfer them to less painful or healthier areas of the hoof. Dr. Steward reports that he applied a Steward Clog to Candip’s “good right hoof” and to the critical foot. The left hoof gets a daily soak to aid in infection control and drainage of the abscess. Candip’s age and mental toughness have turned into his greatest assets. He has a very long road ahead of him, and that road will not be cheap. Great care comes with a price and Madden made the expensive choice to try and save his life with only the best intentions. She makes it a point to tell people that K-Town Partners had no way of knowing that this was happening; he never had any red flags about his feet when he was given to her by the former owners. Though the vet bill has mounted, and the cost to provide Candip special care will also be pricey, Madden refuses to ask them to solely save the horse again. She takes full responsibility for Candip and believes that he is worth every penny for him to get a chance at a good retirement. Candip will be under Dr. Steward’s care for no less than 2 weeks, but it will likely be longer. His costs are: full-care daily stall rest, medication, different fittings of the special wooden shoe, continual readjustments, and the usual blood work. Any money in excess of this vet bill will go to continued care of his feet and farrier costs. Candip has proven the odds wrong before, and he will continue to fight for his chance to do it again. So, until he is healthy enough to go home to Madden’s other OTTB (and compare old racing notes), Candip will continue to be a fighter, he’ll enjoy his Krispy Kreme doughnuts and he’ll beat the odds because fighting back was always his favorite strategy. All horses are special but Candip’s unique personality put him at a different level. Great job, Pati. Wonderful work. I hope hes doin okay. Sounds like he had one tough run at this healing thing. He did, but I’ve been hearing from his owner that he is doing better and moving forward every day. That’s the best news we could ask for sometimes.